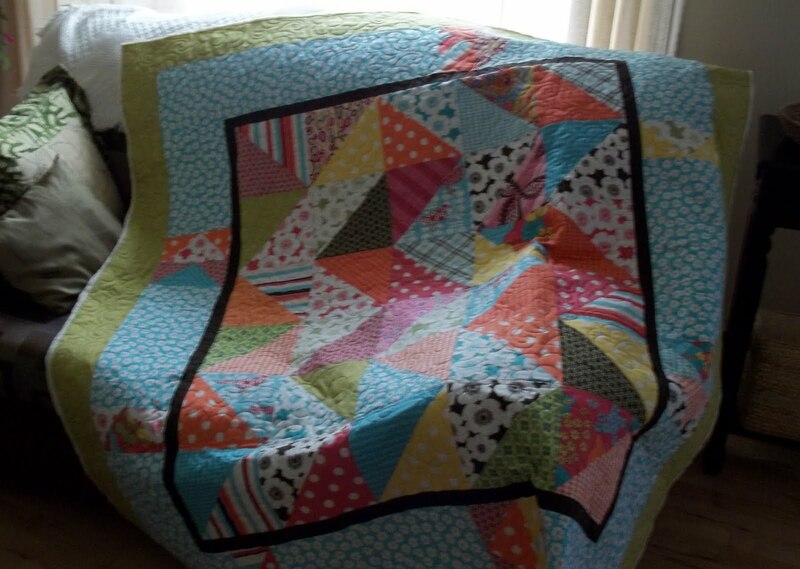 I got this quilt back from the long arm quilter last night. It is lap quilt size around 60 by 64 inches. I'm hoping to get the binding cut and sewn on to be ready to take to the artisan shop downtown next week. My youngest is home for the weekend but spends time between here and his girlfriends. We have a supper party tomorrow night and we hope to get out golfing with my son and his girlfriend. 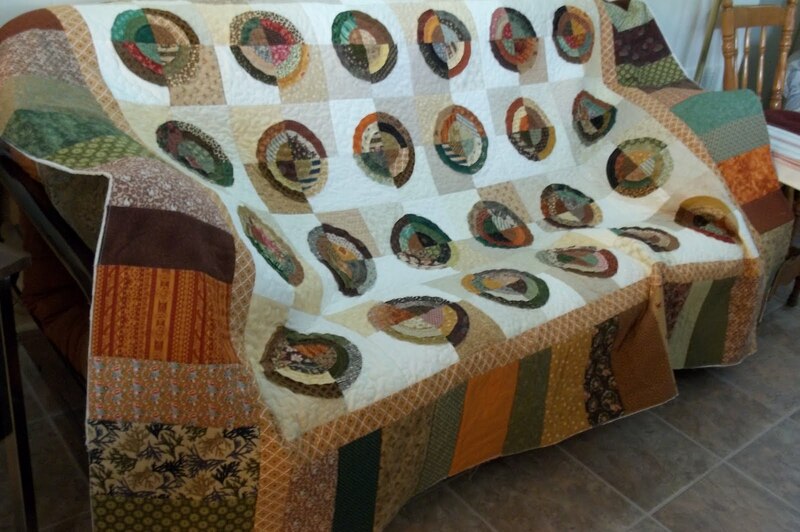 I may get a little time in the sewing room though tomorrow. If not I'll get to it next week. Enjoy your long weekend! I understand it is a US holiday on Monday so I hope you all have some good celebrations and family time. It's lovely to see the sun , finally. I'm having a sort of quiet day today. I have a bit of a of heavy head ache. Yesterday though, I finished up this quilt, so I can put it away until I'm ready to get it quilted. I have two out being quilted right now. This one will wait a bit. 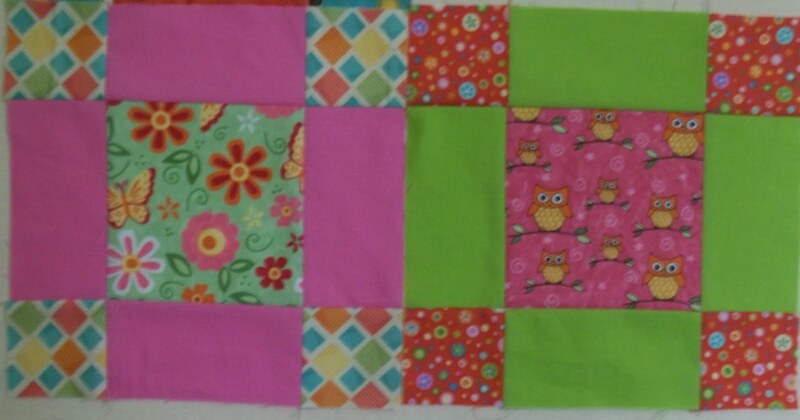 I pulled out a charm pack and some plain cottons to make up a baby quilt. 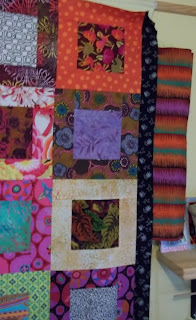 I don't usually like to work with collections but I couldn't resist the fabrics. 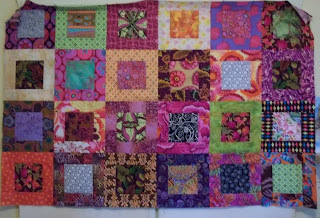 I have mixed in a few others to finish the blocks. Lately, I've been missing the more creative side of me. 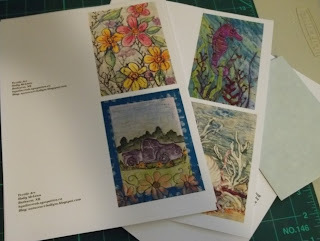 I am finishing up a couple of my own creations, and I've been musing and feeling the itch to do something different. I actually prefer to do more printing or dyeing on fabric and then seeing where that takes me, but it is a process for me that does take more energy and sometimes I just don't have it. For those times, I keep the regular quilting projects on hand because it's easy to pick it up and sew a few seams. 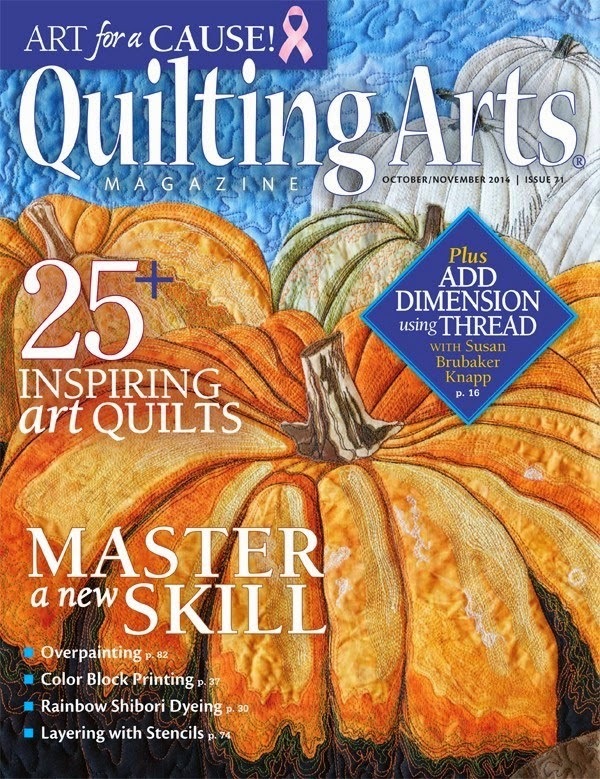 So, for the rest of today, I'm going to relax with some art quilting books and think about what I shall do next. It was supposed to be a gray day with showers today and it was but there was more gray than showers. 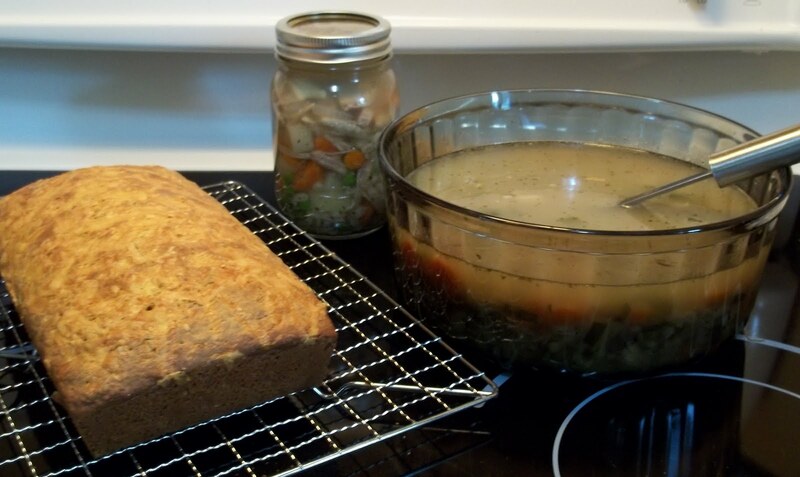 I planned for bad weather though, so last night ,I simmered a pot of turkey bones to make into soup today. My husband and I have been vegetarians since January, but I don't like to waste. I made it up along with a quick oatmeal cheese bread recipe, and took some to Gord's 95 year old aunt and to a friend who just underwent surgery. I'll take the last bottle to his parents tomorrow. 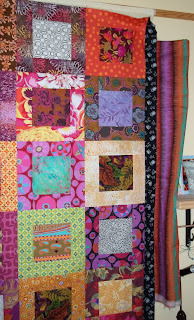 In the last couple of days I managed to get the narrow black borders cut and sewn on. 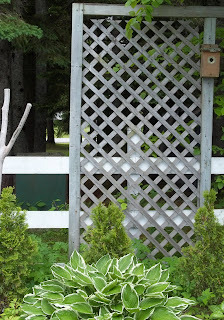 I just cut one of the final borders and hung it to see what it would look like. It's pretty wild colors and patterns! 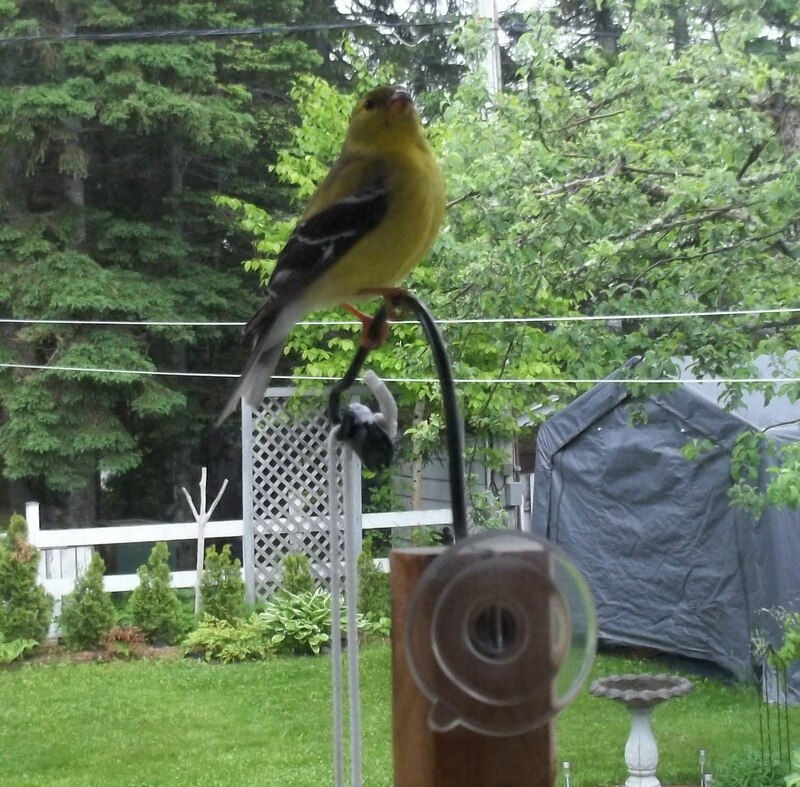 My friend the gold finch will not stop tapping at the window. 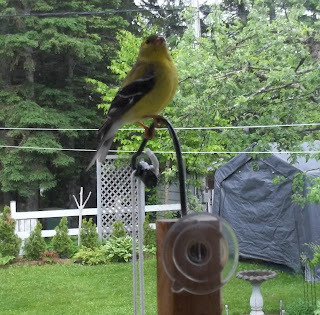 It's the same one and there are many more out there that use the feeder but ignore the window. Today, Gord heard and then found a young chickadee that got into our shed. He left the door open all day,but it would only fly around above the rafters. I noticed it kept going toward the vent where it could see some light and some of the back yard trees. After I commented on that, Gord got the idea to get the ladder and remove the vent from the outside to make a hole. 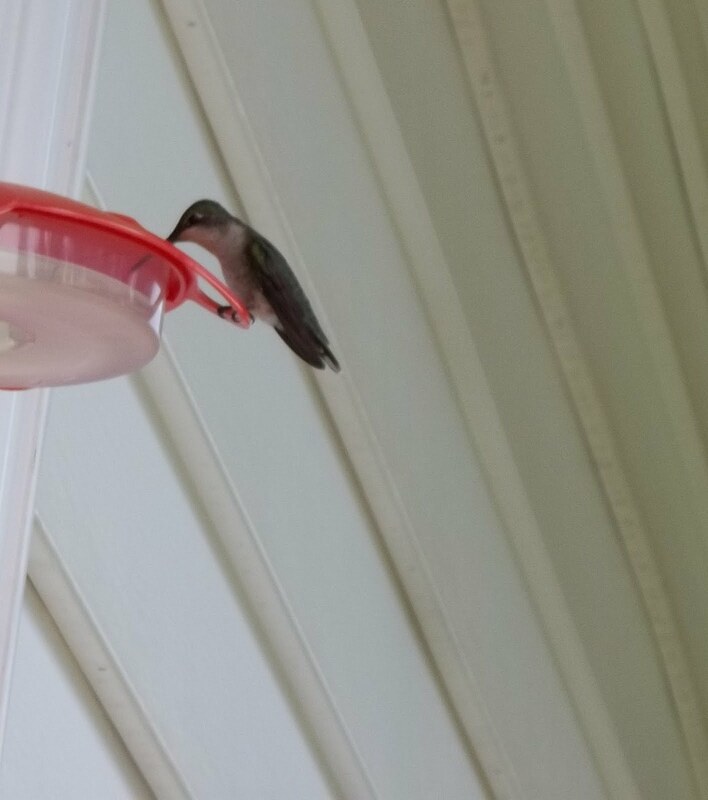 Finally with a little prodding, it flew straight out and home to Mama. We could hear the adults calling to it in the trees. I'm certain it was a chick that I saw amongst 3 others leaving a birdhouse at the back of our yard earlier this week. For years they wouldn't use it because a squirrel had gnawed at the hole and it was too big. Then last summer while on vacation I bought a metal ring that fit over the hole with the right size opening and this spring the birds moved in. Wednesday is my swimming day and sometimes I'm not able to do much else but rest in the afternoon.. 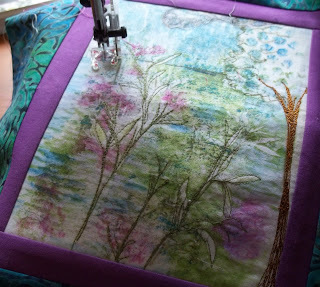 I was pretty tired but I had set up a little piece to be thread painted before I went out, so that after lunch I was able to sit right down at my machine and sew. 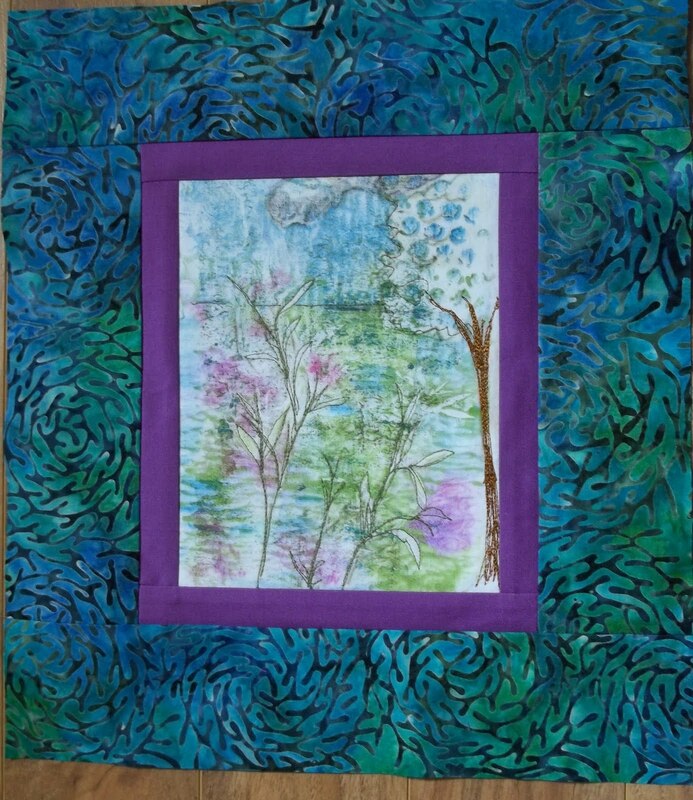 The piece was originally mono printed on a gel mold with fabric paints. 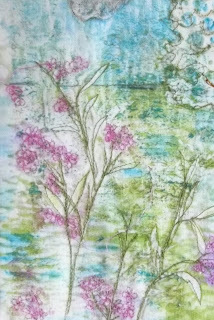 It didn't take very long to do the pink flowers. 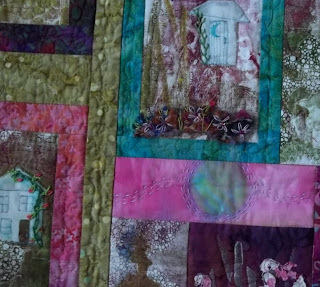 The next step for me would be to embellish with a bit of embroidery, then sandwich and quilt it. I'm thinking that it will be another pillow, there's something bothering me about the tree though. It's the size of it I think. I'm considering taking it apart enough to cut it off or maybe taking out some stitches to shorten it--not sure. I do like the picture above with the tree cropped out, though perhaps it's too much trouble. Maybe I can live with it. Since yesterday was my house cleaning day, I didn't do much else afterwards except some hand work. This is a glimpse of one section of my wall hanging. 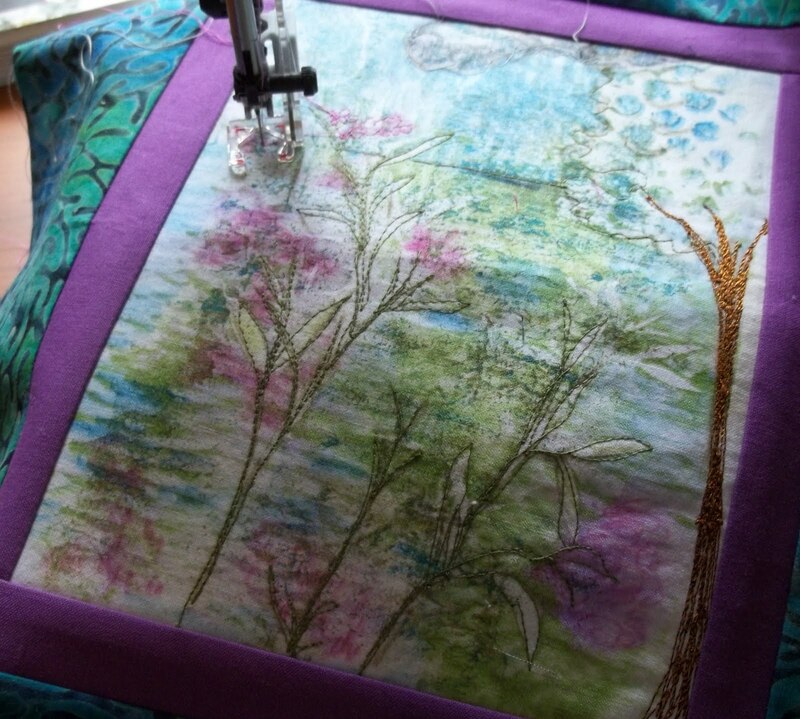 I am slowly picking my way around it with embroidery. Also, I did get some new cards done. This morning after I got up, I could hear this funny noise coming from my sewing room. 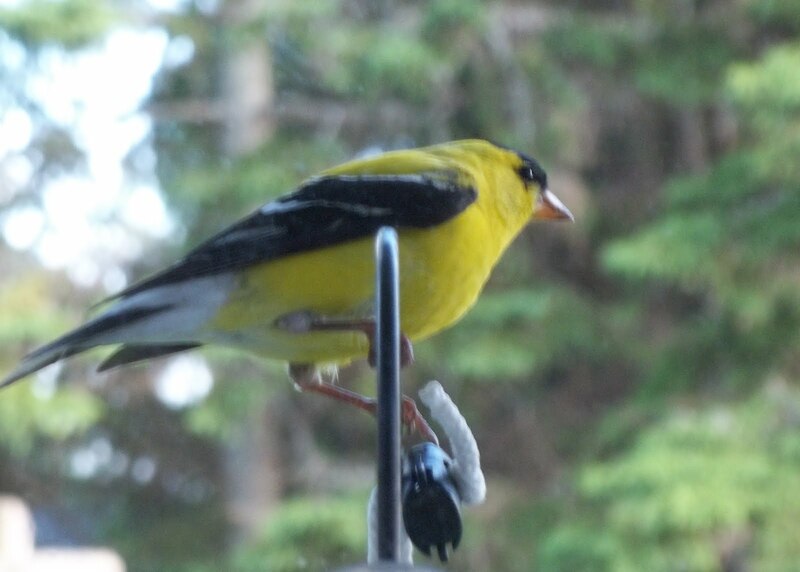 I thought at first it was my computer, but discovered that it was a gold finch tapping away at the window. It is cloudy and gray this morning, and he must have been seeing his reflection in the glass. Yesterday, I got a phone call for an appointment today with the endocrinologist in Campbellton which is about an hours drive from here. So, that's where I'm heading shortly. An otherwise damp, rainy day today was brightened first by a trip to the market where I purchased a bouquet of perennials and herbs grown by a lady named Eleanor. The second bright spot in my day was to share tea and a muffin with my friend, Wendy. I made the trip to her house to pick up some fabric that I thought might work as a narrow border on my quilt. She had in her words "taken it out for a drive" yesterday on her trip to town when she forgot to drop it off here. 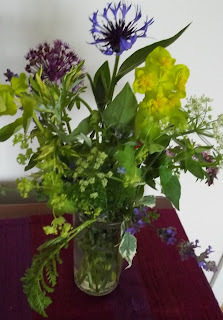 The bunch of flowers was so large that I had to divide it into two bouquets, so I gave one to Wendy. My intention is to use mine to do some watercolors but you know how that goes. It's Saturday night now and I only plan to take a bath and perhaps knit later. we've booked a tee off time for tomorrow although that may be cancelled if it's raining. We're going out for Father's Day breakfast at least. Once I got home from Wendy's, I tried the fabrics and then decided that my fabric would do after all. (It was worth a visit though.) 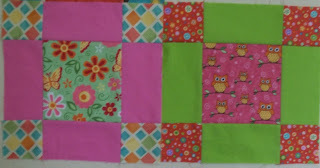 I cut and sewed on the first narrow border and have pinned up the final border in 2 different directions. I think I like the second one. I've managed to take the photo when it had not quite focused. My new camera takes a nice picture when I take it at the right time. I seem to have difficulty knowing exactly when it is in focus. I really need to read the booklet again but I don't have the patience for it. Well, I followed a girlfriend's suggestion and I drove up early yesterday morning to my friend's camp where I joined them for the second day. I did get lost as I feared but got there before 10 am at least. We read in the camp journal that we've been doing the retreats since 2005. As is always the case with a bunch of women with similar interests, the day was full of gab, good food, lots of sewing , knitting and laughter. Even 1 day was good for the soul. This cute little hand embroidered item is actually a clothespin bag. Can you just imagine hanging your clothes out sporting it? 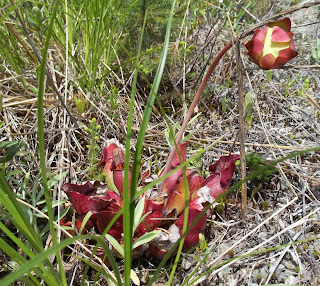 At noon the flies were not too bad; a few of us ventured outside to stretch the legs. 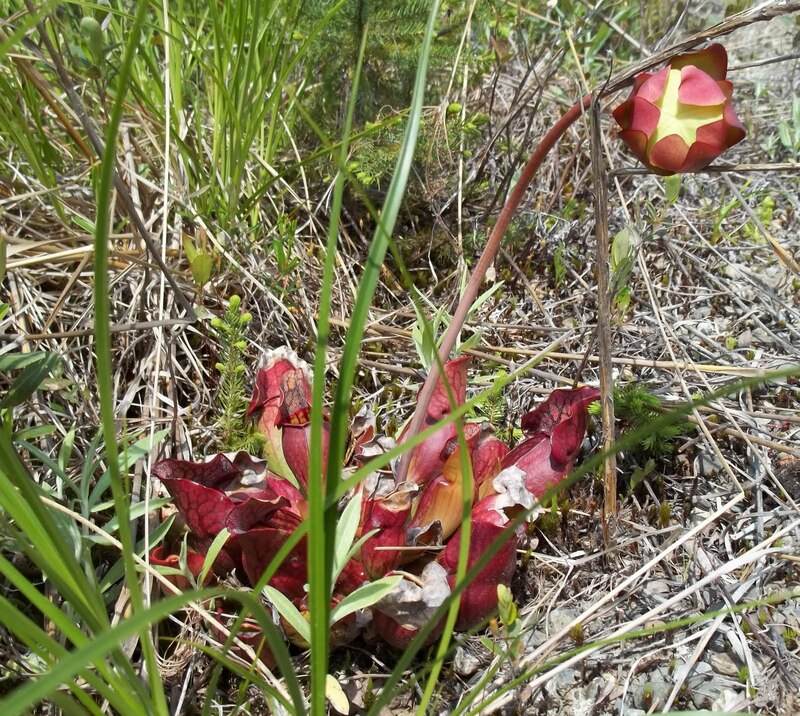 I took pictures of these plants which I was told are pitcher plants. They are pretty unique. 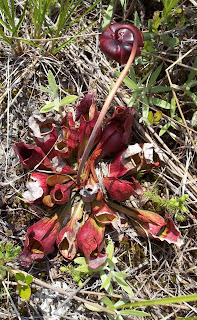 It looks like a little balloon inside the petals and the leaves are hollow (hence the name) and catch water and insects. 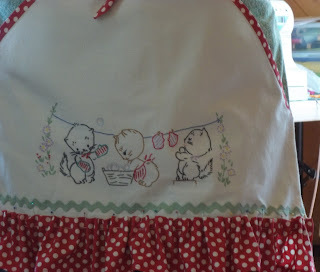 Today, I'm putting wash on the line and heading out for a couple of small errands and then a dental appointment for a cleaning. I'll be home after lunch and hope to still have a little sunshine to pass some time outside. I'm getting ready to head off to my friend's camp for the day and hoping I don't get lost. I'm sharing another view form my deck. 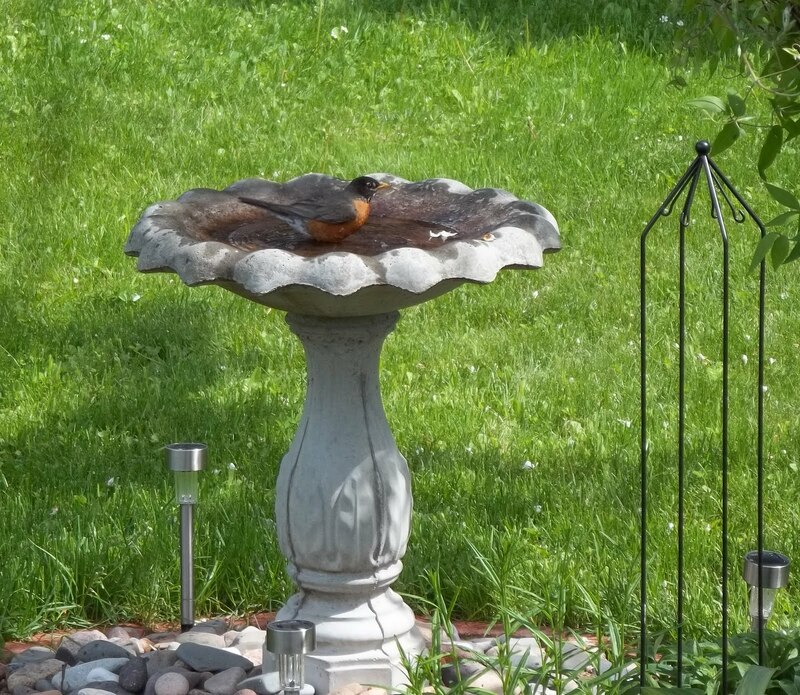 This birdbath entertains me all summer. Well, my quilting friends are off to the camp for their retreat and i didn't feel too bad today. The weather cooperated and I had quite a nice day. 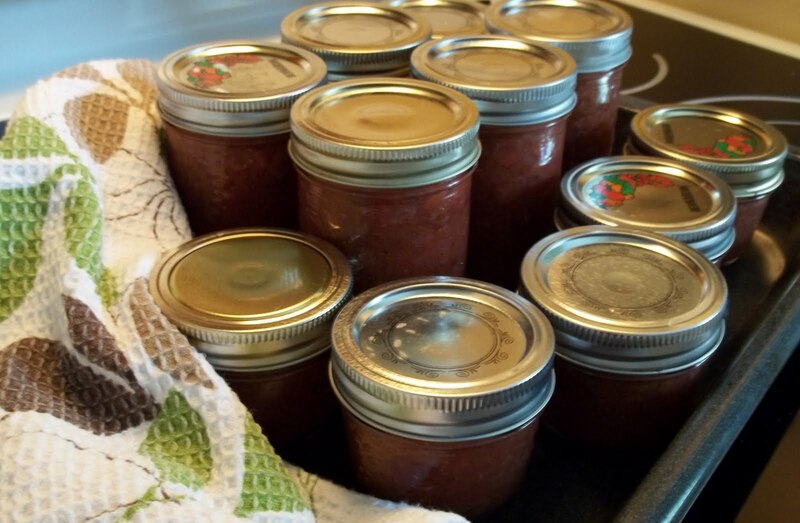 I made rhubarb strawberry jam and then went for a bike ride. I met with a porcupine who wouldn't move off the path. I had to follow it for awhile until it finally took a right onto another trail. If I got too close it would raise it's tail. Of course I didn't take my camera. I had a leisurely lunch on the swing on my little deck and I did the watercolor of the allium. Then I sat and knitted for the rest of the day. 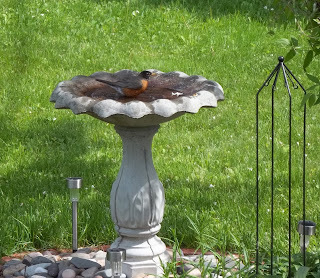 The birds were singing, there was a gentle breeze and I had the sound of the water form my little fountain. It was perfect! I just got directions to my friend's camp which is about an hours drive from here with some dirt roads. I believe I'm going to get up early and go up for the day. They're coming home at supper time tomorrow night and always stop at a little take out on the way home. 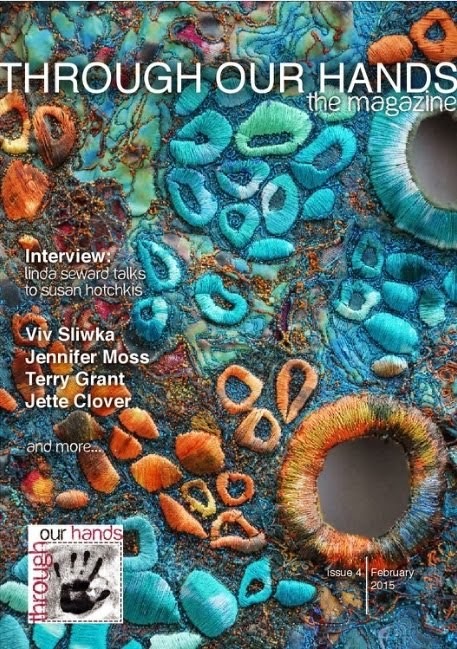 I'll take some hand work and my knitting. I couldn't believe it when I looked at my last post and it's been a week since my last post. 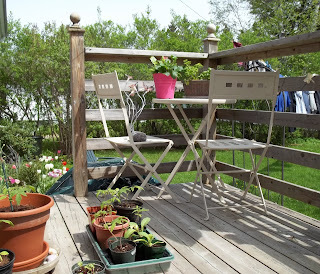 The weather improved and I've been doing a little gardening each day. I imagine you are tired of seeing pictures of my meager little plots, so I won't show that until the plants at least fill out. On the weekend I went golfing with my husband and I must say I really am improving! I actually got bogies (I'm learning the terms) which is one over par on 2 holes. I tied those with Gord. Then to top it off, I out drove him on 2 holes. He teased that he wasn't giving me any more tips. I think he is just happy to have a golf partner though.This is all quite new and exciting for me. 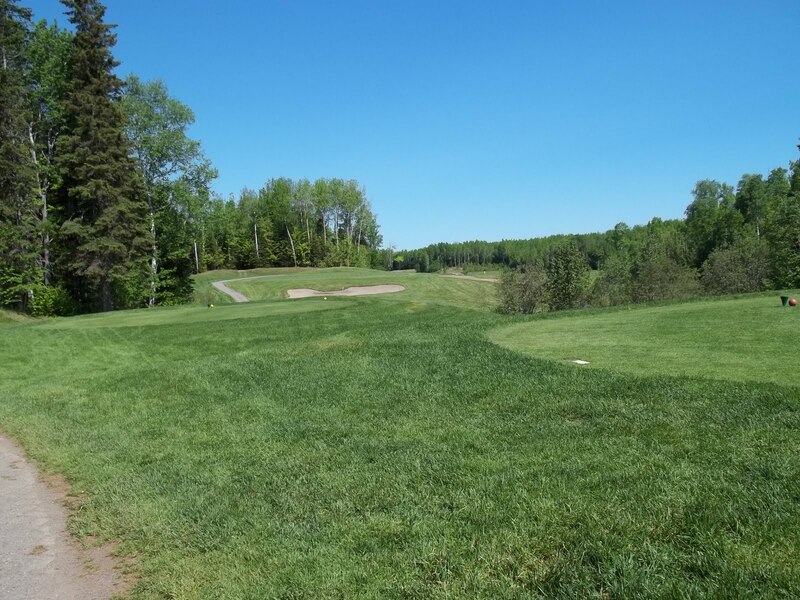 The picture below is a view from the tee of the par three. 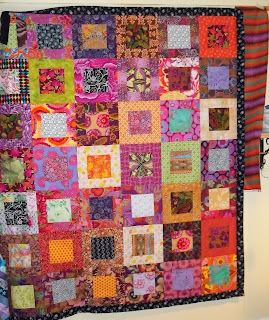 I've been slowly putting together the cobblestone blocks of the Kaffe Fassett prints. Here are the first 4 rows. 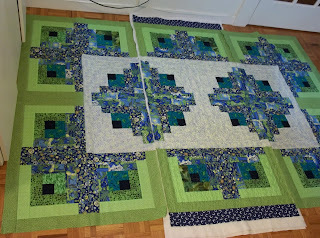 The next two are pinned together and then there is just one more after that. Today, it was raining again, and so I sat and did some hand work. 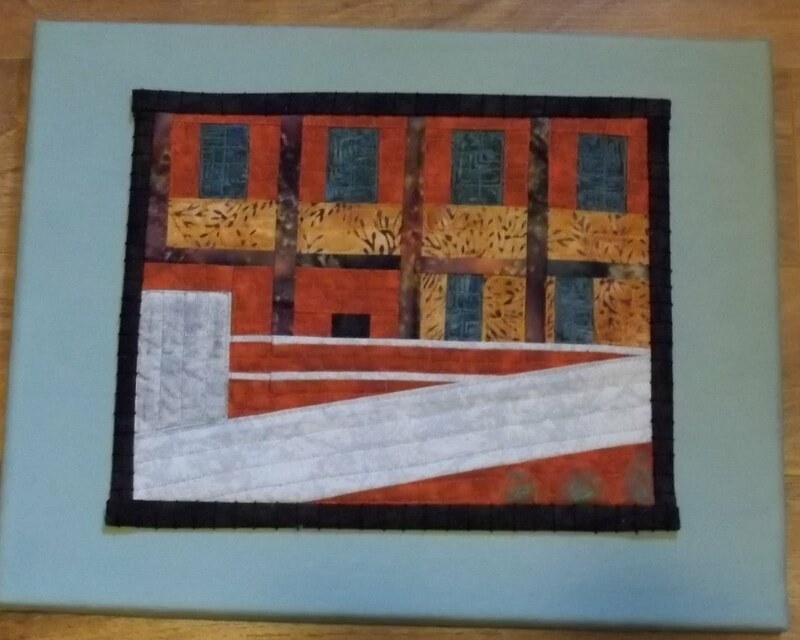 I got this little piece of a view of our mill that has just been torn down sewn onto the canvas. 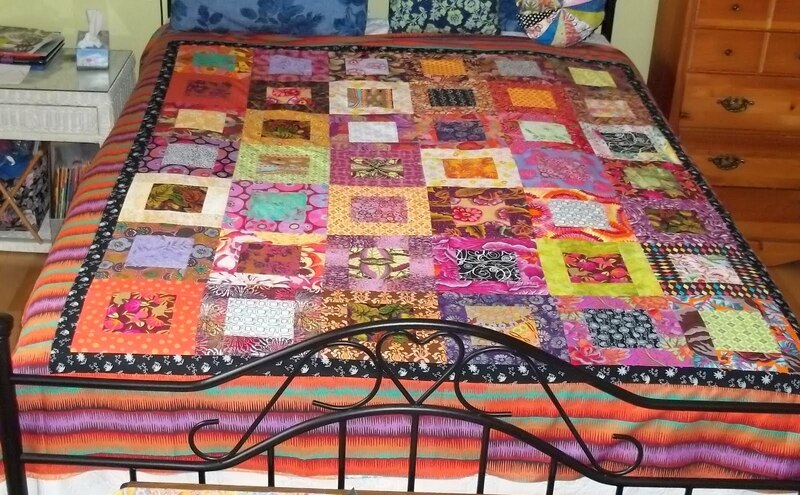 Originally, I had a zig zagged edge, but I didn't like it so I added the binding and I am happier with it now. Tomorrow, I'm going to be feeling a teensy bit (well maybe a little more) sorry for my self, as I have made the decision to stay home form the girls quilting retreat. 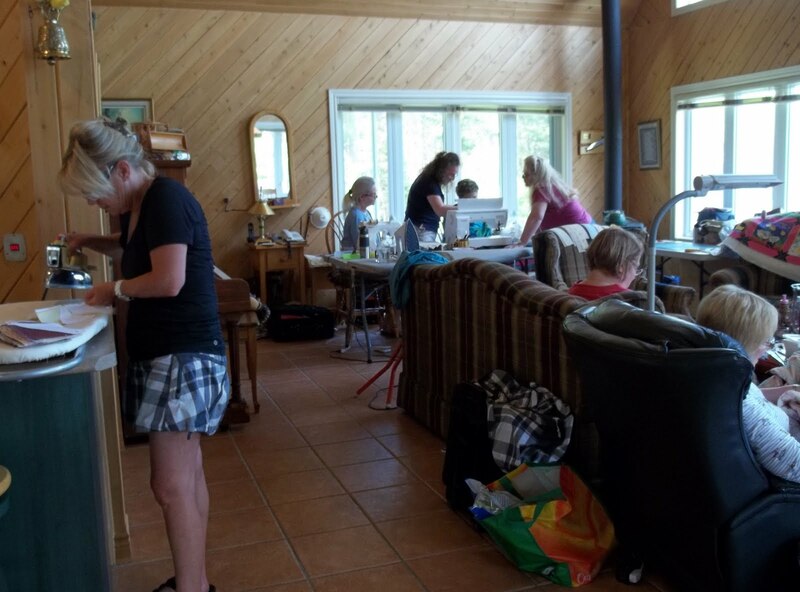 There would have been 13 women at the camp (it is large and very nice with even a dishwasher!). I never know when I'll have a good or bad day and I have a very hard time to sleep anywhere else but home. When I don't sleep, I usually have a headache and feel nauseous all day. I will be thinking of my friends all day, but I'm going to try to keep busy and try to enjoy my day at the same time. I might make rhubarb strawberry jam in the morning. Contrary to the weather forecast, the sun came out this morning and stayed for the day. I dried a line of clothes. This morning, I cut up rhubarb for the freezer and for these muffins. I so love it when things start to grow! 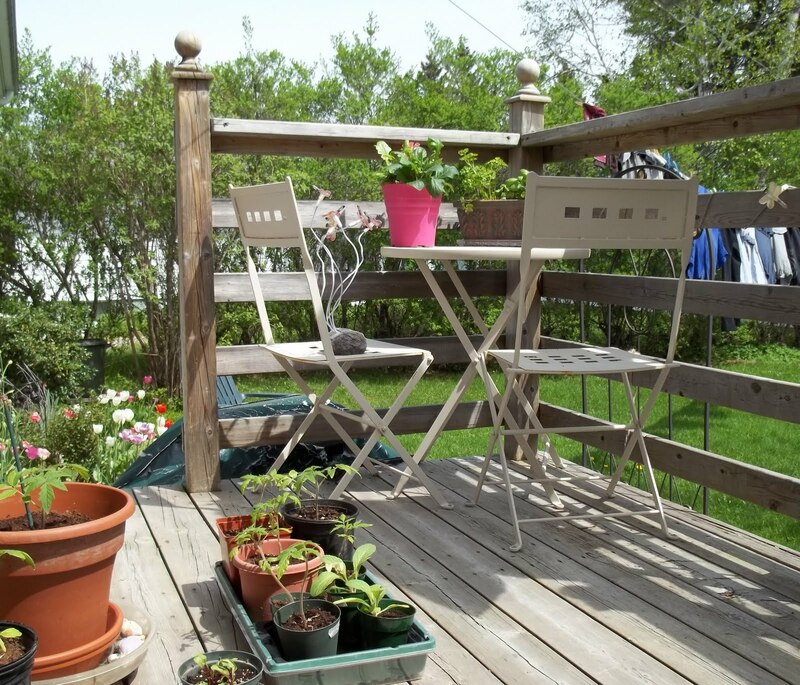 I went outside before lunch and put in the last of my vegetable seeds in this once flower garden that wraps around my deck. 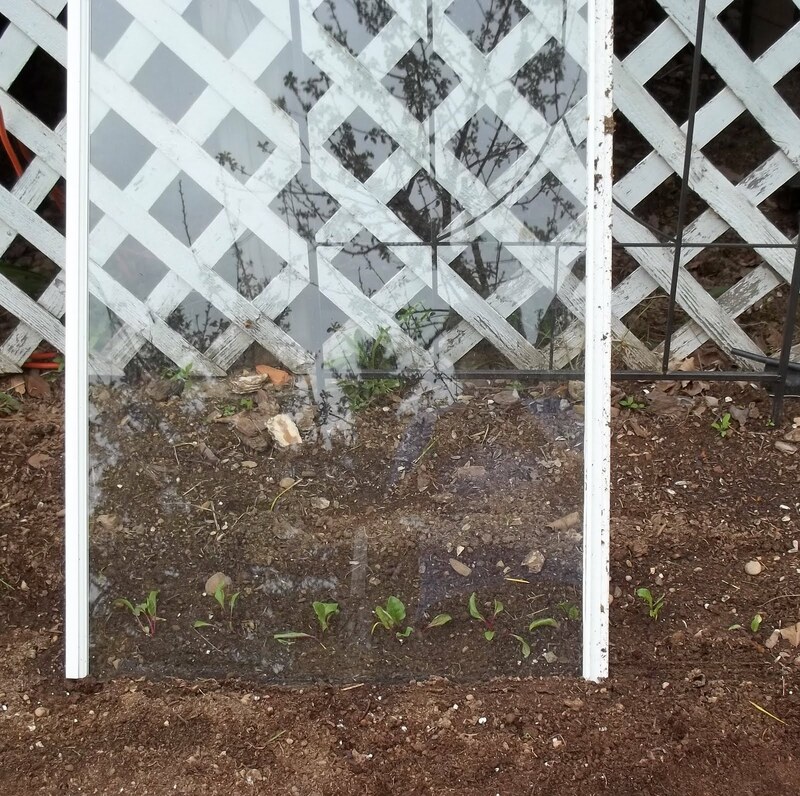 You can't tell, but there are little beets under the glass. Behind the beets re pole beans. The only flowers left are the purple and white cone flowers in the middle. 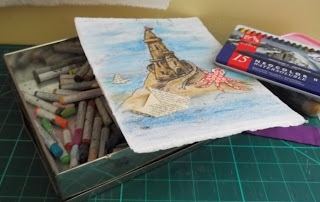 Then, after lunch I had a few minutes so I started putting a small border on my mill piece. I had sewn it to the canvas that is behind it in the picture, but I didn't like that it looked crooked because of how the raw edges stretched, so I took it off. I think it will be better with the dark grey binding. I'll hand stitch it back on the canvas. To-night, I went to our end of the year guild supper. I don't have any pictures because I left before the show and tell. It was a nice dinner though; it's always fun to chat with everyone. 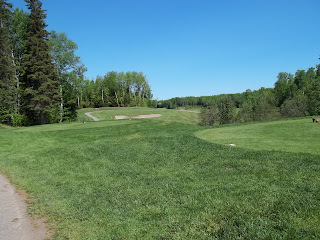 I went golfing this afternoon for the 2nd time this year and we were blessed with a lovely sunny afternoon. I can barely handle 9 holes; I was not as done in this time as last time though. I finished this little illustration this weekend for a project my sister and I are working on. 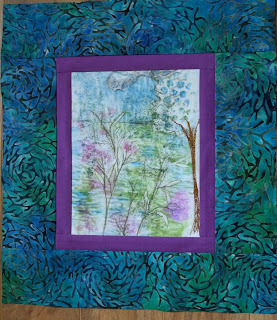 I pulled out this piece that I mono printed and thread painted last last year and put the borders on. I think I will make another pillow since I sold one at the shop downtown. 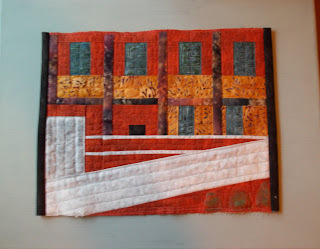 I will add a little more stitching, sandwich it, quilt it, and as usual, I will add a bit of hand stitching. There is a tapping on my window as I write. June is here and I know summer is coming when the June bugs arrive. It's been too cold so far. Friday, some of you may know is my errand and lunch with friends day, so I don't accomplish a whole lot. 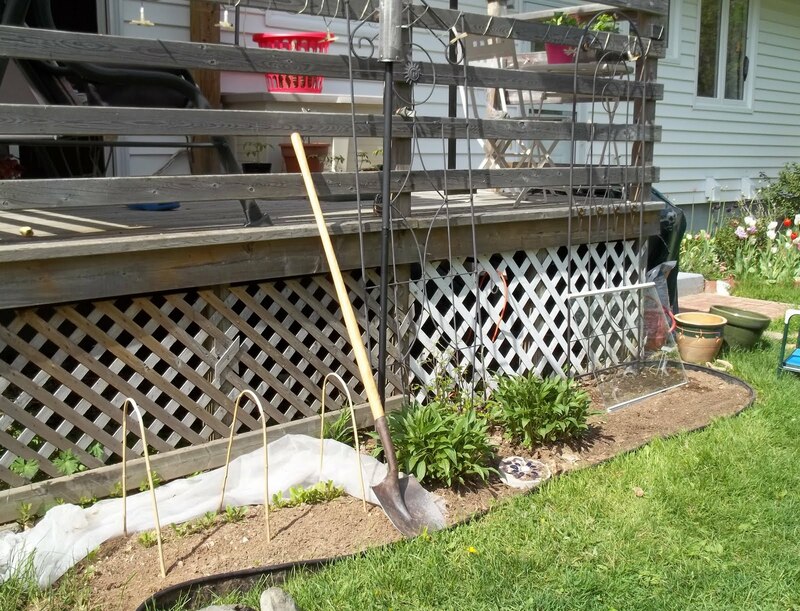 My priority right now is to get my gardens finished --the vegetable parts first and then the rest. This afternoon once my few groceries were put away, I went outside to do a little bit more gardening. It was quite cool and threatening rain, but it held off. This garden up against the back of the house has always been a bit of a challenge. While it is facing south, there are also 2 vents from my downstairs laundry and bathroom which exhaust into the middle of it. 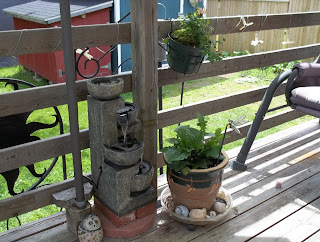 I have 2 holly bushes which do well but a lot of flowers do not as they get fungus growth from the moist air I assume. 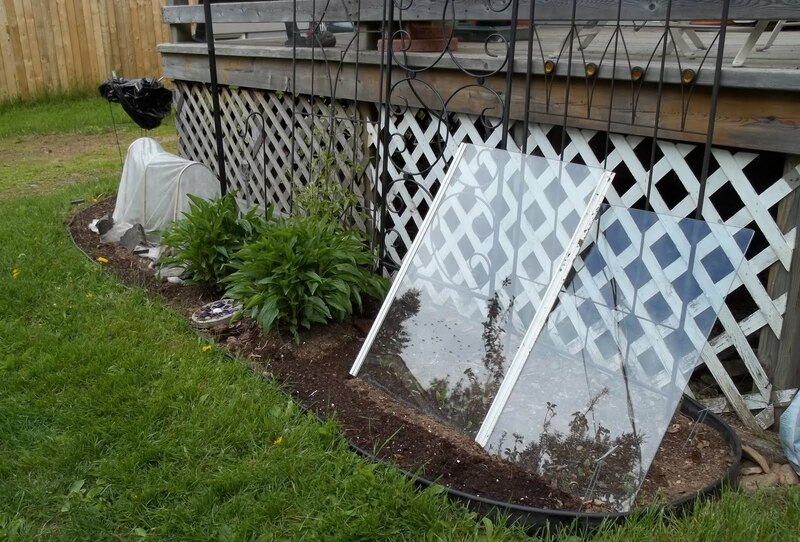 I am able to get plants to grow near the front and away from the vents. Today, I dug up a lot of old tulips that needed dividing, and I have decided to try putting the rainbow colored Swiss chard in rather than flowers. 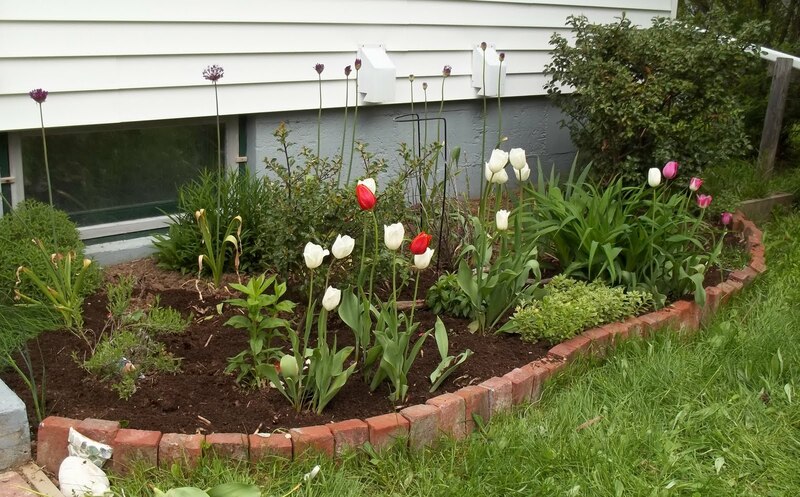 There are a few perennials but that should add to the color. I added compost and it's ready for the seeds. As I wrote yesterday, I went to my friend Elise's for lunch and some sewing after our morning swim. It was thundering and lightening when we first got into the pool. It is indoors but still, there are 2 walls of windows. It did stop though, and by the time we got to Elise's the sun was coming out. Her sewing room has a lovely view of the back yard; it was very relaxing.We sewed there until nearly 4pm. Her husband even kindly left out a snack for us to find when we went for tea upstairs. 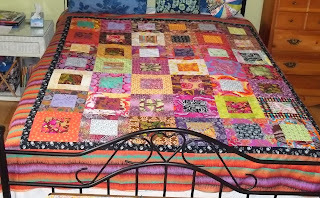 This is a rag quilt that Elise just finished. They are so cozy. I particularly like the circle pattern. And this is the quilt she was machine quilting. 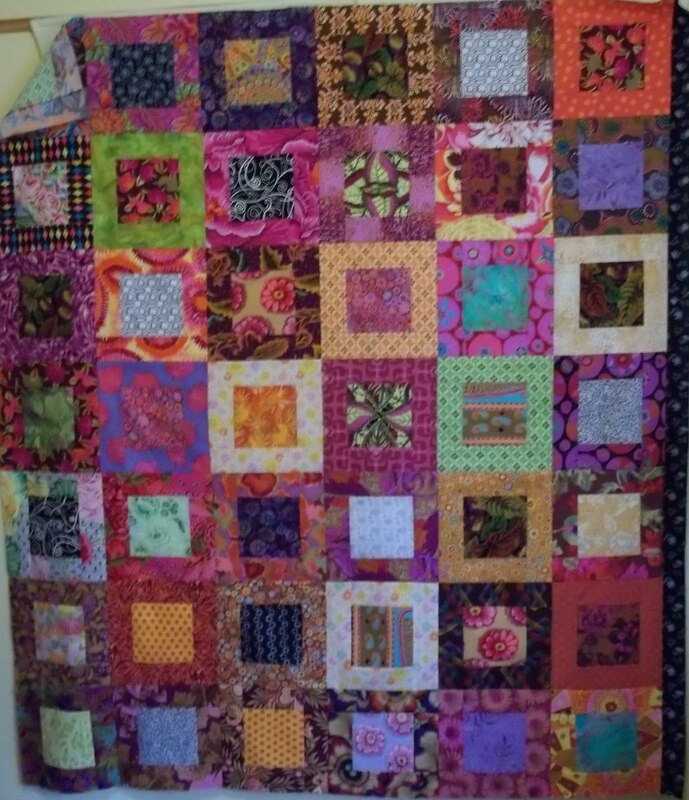 As you might notice , she is quilting it in 3 sections and joining it afterwards. I absolutely love the colors! I am very happy that I finally finished all the machine quilting on my wall hanging so now I can put it in a basket and drag it around all summer with me to hand embellish. Some of you might remember that Wednesday mornings I go to a nearby spa to swim in the salt water pool and do the sauna. I thought it was going to be sunny until this afternoon and would have been sorry to miss some gardening time but no, upon arising this morning, it is raining again. It's a good day then, for inside and some sewing. 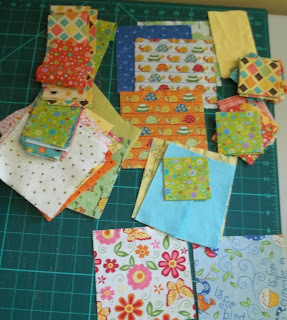 I've been invited for lunch and an afternoon of sewing at a friend's house. 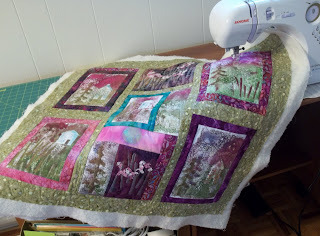 I'm bringing my mystic woods wall hanging and hope to finish up all the machine quilting. Yesterday was a lovely day. I spent some welcome time in my garden. Since I'm not working I'd like to put in more vegetables. 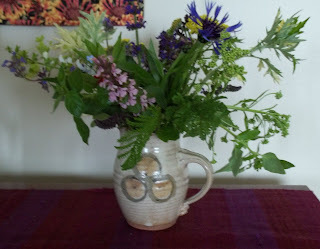 I've been slowly enlarging my once flower garden spaces and taking out some of the flowers as there isn't a good spot in our small yard for an actual vegetable garden. In this space I have cone flowers in the middle in front of a clematis vine. Yesterday I added about 6 inches all the way around the space. 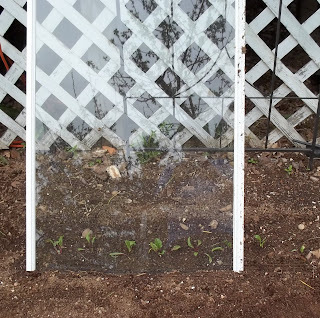 On the left spinach is growing. I have to keep it covered so the ground hogs won't eat it. 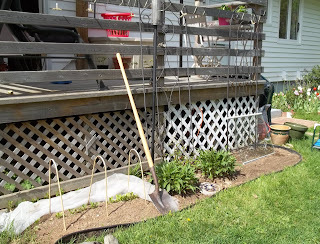 I planted pole beans on the right side and plan to put beets or bush beans in front of them. You can jsut see the hint of a garden against the house. 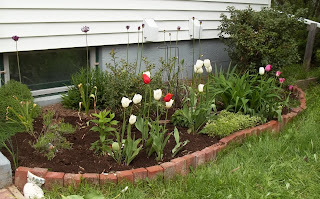 where the tulips are I plan to put the multi -colored Swiss chard as I find it is very pretty and worthy of a flower garden space. This is the view from my swing where I spent a good part of the afternoon.